The Bethel Public Schools are on a 2 hour delay schedule today, Wednesday, January 30, 2019. We are also monitoring the afternoon weather and will provide an update if needed. Afternoon Weather Update – Given the high probability of afternoon snow squalls which cause high impact, very disruptive conditions, which have the potential to make our afternoon bus runs extremely dangerous, we will be reassessing at 7 AM to determine if a closure is needed. A message will be sent out either way at that time. District office staff should check their emails for updates. 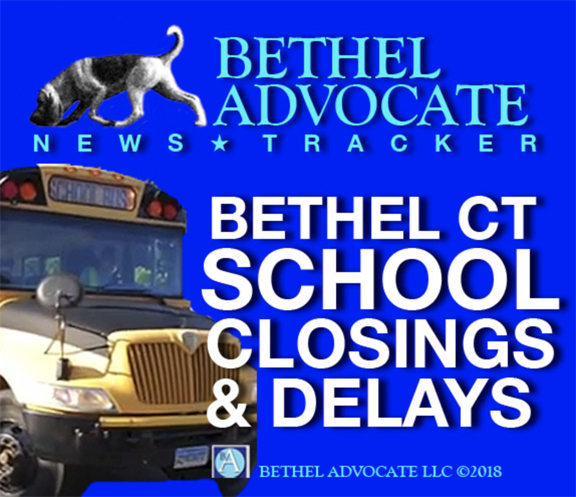 The Bethel Public Schools are closed today, Wednesday, January 30, 2019, due to the high probability of the impact of afternoon snow squalls. District office staff check your email for info. Areas of black ice are expected to develop through this morning as residual moisture freezes on untreated surfaces. line of snow showers and/or snow squalls. Brief whiteout conditions and a quick coating to inch of snow are possible with any snow squalls. This could make for a hazardous travel conditions for the evening commute. Please listen to NOAA Weather Radio or go to weather.gov on theInternet for more information about the following hazards. An arctic cold front will pass through the region Wednesday afternoon into early evening. This front may be accompanied by a line of snow showers and/or snow squalls. Brief whiteout conditions and a quick coating to inch of snow are possible with any snow squalls. This could make for a hazardous travel conditions for the evening commute. * WHEN…From 7 PM this evening to 10 AM EST Thursday. Areas of black ice are expected to develop late tonight into Wednesday morning. Temperatures will drop through the teens and lower 20s during this time, causing residual moisture on untreated surfaces to freeze. Motorists are urged to use extra caution while traveling early Wednesday morning. Scattered snow showers, mainly between 1pm and 5pm. Increasing clouds, with a high near 26. Wind chill values between 5 and 15. West wind 8 to 17 mph, with gusts as high as 45 mph. Chance of precipitation is 40%. Mostly clear, with a low around -2. Wind chill values between -5 and -15. West wind 9 to 17 mph, with gusts as high as 38 mph. Sunny and cold, with a high near 13. Wind chill values between -5 and -15. West wind 8 to 13 mph. Mostly clear, with a low around -2. West wind 3 to 7 mph. Mostly sunny and cold, with a high near 18. Calm wind becoming west around 6 mph in the morning. A 40 percent chance of rain. Mostly cloudy, with a low around 35. A 30 percent chance of rain. Partly sunny, with a high near 50.